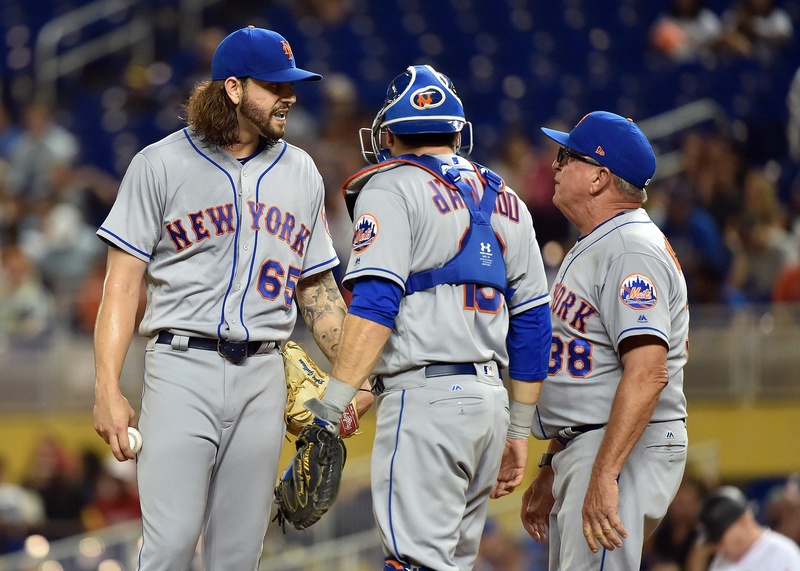 The injured Mets’ starting pitchers would, if healthy, comprise the best rotation in the… National League? National League East? New York metropolitan area? It doesn’t matter, of course. Sandy Alderson already admitted the team is in *fire sale* mode, a theme your intrepid BP Mets staff will explore in greater detail this coming Monday. MEANWHILE, promotional giveaway Tim Tebow took the spot of a deserving St. Lucie Met yesterday afternoon. ALSO MEANWHILE, the Mets’ defense let down the Mets’ bullpen. Marlins 6, Mets 3. Once Robert Gsellman injured his left leg trying to beat out an excuse-me chopper, the game’s outcome didn’t matter. Gsellman batted in the fourth having already singled in a nine-pitch at-bat against Marlins starter Dan Straily, thereby adding 35 points to his 2017 batting average. His second plate appearance came with runners at first and second, with the Mets having closed the Marlins’ lead to 3-2. Gsellman tapped a two-hopper to the first base side of the mound and slowly jogged toward first in typical “pitcher grounds out” fashion. Straily stepped down from the rubber, reached out, and watched the ball tip off the side of his glove into the no-man’s land between first and second. Witnessing the flub from the baseline 10 feet from home plate, Gsellman shifted from first gear into fifth. Dee Gordon raced in from his position, bare-handed the ball, and flip-rolled it toward first base. Gordon’s effort would have been just for show had Gsellman’s hamstring not seized up with two steps to go. Gsellman grimaced, limped into first, and was out by half a step. That play ended the fourth inning, the pitcher’s night, and our fever dream that Rafael Montero would never start for the Mets again. Mets should find out if Tebow can pitch. “We don’t know what the doctor said.” — Gary, on Michael Conforto’s injury status. In tonight’s game, temporarily healthy Steven Matz faces career-below-replacement-level Jeff Locke, as the clock ticks down to the trading deadline. Scott D. Simon is an Associate Editor of BP - Mets. He is also Commissioner of the Westchester Hebrew Softball League and an attorney in New York City who specializes in commercial litigation, financial restructuring and bankruptcy. A tip of the Mets cap to Ron Darling, for not being afraid to tell it like it is.